In a wonderful 15-minute video from 1969, a young Jim Henson shows you how to make puppets out of ordinary things. Yes, it's SLYT, but it's a really good SLYT, so I beg forgiveness. This is awesome, no apology necessary! Somehow, a favorite seems almost insultingly inadequate to express my feelings about this. What's with all these people begging forgiveness or asking folks to be gentle with their FPPs lately? Just make your post and own it. MeFi will do as it will with the content, but if you're unsure about a post don't post it. That said, thanks for posting. This is great! My favorite thing about this video is how serious his assistant looks. As if he is thinking, "yes, yes, that's exactly how this tennis ball should look as I make it nod, completely within engineering specifications." Kermit sure does a good job running that big Jim Henson puppet. You can always tell it's Kermit, though, from the voice. Few things can make me feel happy and sad all at once in quite the way videos of Jim Henson do. I would like to rename MetaFilter to MuppetFilter. Is that Frank Oz helping him? Spoonhead sounds a lot like the pre-dubbed voice for Emmett Otter's mom. More proof that the 60s conter-culture movement continues to destroy America. And spelling. And comedy. And self-worth. Is that Frank Oz helping him? No, that's Don Sahlin, the designer of the Muppets. Everyone please stop adding "SLYT" and pre-emptive apologies to posts. Just post the video, please. Oh wait, this is rather good. I'd just like to remind everyone again that SLYT does not rhyme with "might". It rhymes with "mitt". Never ever apologize for linking to Henson. He is one of the pillars upon which the world stands, and is not destroyed. Who let Sam the Eagle in here? It never ceases to amaze me what life Henson could give to a sock and a couple of ping-pong ball halves. Here's a script and patterns to make actual Muppets for a Christmas play (and save the $100 they charge to build you one at FAO Schwartz). This article appeared in Woman's Day in 1969, and apparently gave a lot of budding puppeteers a foundation to build on. Derail: Forty years later, the various political parties are building candidates like this. Only they're using sewage as their raw materials. There's a third person, though. Don Sahlin stays above the table during the taping. Seeing as Rowlf makes a cameo, I think we can safely say that Frank Oz is below deck. That's just peculiar. Rowlf is (was) worked and voiced by Henson. I think it's clear from the very beginning of the clip that whoever is working Rowlf is playing to a recording of Rowlf's voice, as any of the actual Muppeteers would never be that sloppy with the mouth work. I have no idea who is working him during the beginning of the video, but it's certainly not typical. Last fall, I went to the Center for Puppetry Arts in Atlanta (well worth the tour of historical puppetry with lots of interactive features); they have a big room dedicated to Henson and the Muppets and Fraggle Rock, etc. There are videos and big pictures and various characters and it is awesome. Tucked away in one corner, there was a hands-on section with some felt-covered orbs, and a variety of features (all flat, no half-ping pong balls or anything) you could stick onto the heads - it wasn't quite the Muppets, but it was close enough for a tiny little thrill. You're right, I was confused. 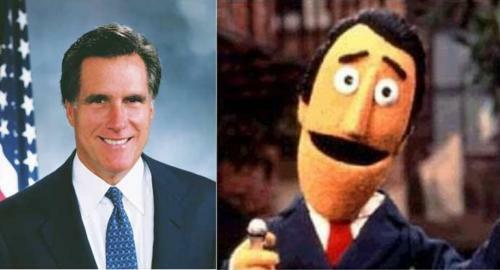 The weirdest part is that the other puppets sounded to me exactly like the puppets on Mr. Rogers. I just want to apologize to everyone in advance for the vacuity of this substance-free comment. Sorry. The legendary Keith Johnstone talks a lot about the way that a mask takes over an actor - but these puppets (even the simplest) comes alive in just the same way - viz Spoonhead in this clip. I'm pretty sure the "German old lady" puppet is actually Lady Elaine Fairchilde, mudpuppie. Probably before she became famous (and O.D. 'ed, but that's what sudden celebrity does to some people). I am committed to building puppets out of kitchen utensils. Folks in the Des Moines area, who's with me? Thank you for this, from the bottom of my fuzzy, left-handed heart. I have a little girl, gonna turn 1 next week. This has every rainy afternoon from now until she discovers boys covered. I can't thank you enough for this vid! Save it for the paying customers. Tho it is easier on the feet, not having to wear the ballerina-boots. At the end he says "...and the next time we get together we'll take these shapes and add features to them to give them different kinds of characters." Where's that video? Also, awwww that dog is sooo cute! This is great. For some reason I keep picturing Adam Savage and Jamie Hyneman doing this video, probably because of Don Sahlin's seriousness. Thanks for posting this. I wish they had the follow-up video he alludes to at the end. As a kid, I had a terrific book about how to make muppets from household items. It came with a bunch of fake fur and googly eyes. To this day, I can't see a wine opener without picturing the little man I transformed my parents' into. I'm at work and so have only watched the first minute, with no sound. But how muppety is Don Sahlin?! (Assuming he's the one introduced at the end of the first minute). He's got the funny stick-on moustache and the big comedy glasses. If I watch long enough, will Jim Henson pull his nose off and give it a squeeze? But how muppety is Don Sahlin?! Muppets and puppets always win, hands down, in my book, over man-made robots. I just clicked this link and now I'm 15 minutes older but 20 years younger. How the hell did that happen? - Teaching Puppets to make Muppets (this appears to be one of Henson's assistants). blue_beetle: "Derail: Forty years later, the various political parties are building candidates like this."